Our vote this Tuesday will determine the next governor and state superintendent. These two elected officials will lead our kids’ schools for the next four years. The governor we vote for, will be someone new. He or she will have the potential to affect great change throughout the state. The governor will recommend how the state spends its $1.8 billion dollar education budget. Take some time to research the candidates. Who do you want to lead our state as governor? The position of state superintendent is also up for election. 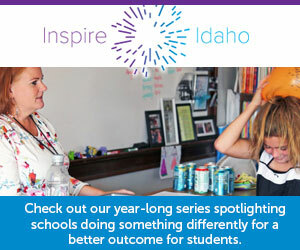 If you do not like how education is run in Idaho, this is your chance to make a change. If you like the direction education is headed, you can vote to support the incumbent. In 2014, the superintendent’s race was so close, that it was determined by less than 2 percent of the vote, or less than 5,600 votes. This election has the potential to be just as close. This is your opportunity to do a little research and make an informed decision. Our kids deserve parents who take the time to be informed voters. Our kids deserve leaders who will make the best decisions for their education. Let’s make this vote count … for our kids. Vote this Tuesday, and wear your sticker with pride.